for dancing dyeing in the streets yard. Dyeing outside has some huge perks this time of year. First and foremost, it doesn't add any heat to your home on hot summer days. Secondly, clean up goes a lot quicker! And third, space, or a lack of space, won't stand in the way of giving it a go. So if you have ever been curious to dive into dyeing, but let the lack of a proper studio hold you back; this is the season for you! Dyeing is so much fun, it should and could be accessible for everyone. It’s easy to put together a dyeing kit that you keep in a tub and can whip out as the mood strikes you. 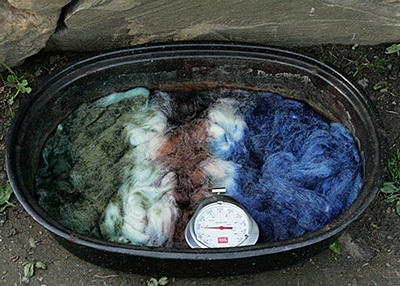 You can get right to dyeing – no hunting and gathering of equipment. Just to be safe, nothing used in dyeing should be used for food again! Setting up your space will hinge on a few factors. B. How many folks are going to be playing. Card or picnic tables are great! But not at all necessary, as the ground, or porch provides a huge work space - enough for you and friends to spread out & collaborate. Dyeing outside also lends itself to harnessing some solar power. In our energy-starved times, we are all [or should be] thinking about minimizing our environmental footprints. Making more efforts to turn off our lights as we leave the room, buying organic, using canvas shopping bags, carpooling, using public transport and even investing in fuel-efficient hybrid cars With these issues in the forefront of our thoughts, it becomes apparent that passive solar energy is a hand dyer's best friend. Not only for hanging our dyed rovings out in the sun to dry, but utilizing the sun's rays to set our dyes. It can be as simple as putting a black roasting pan in the sun for the day, or as involved as utilizing a solar cooker to maximize conductivity and minimize cooking time. For the sake of this article, to show how simple it can be, I did both. On a day where the high temperature was in the mid to lower 60s (f) in the sunniest spot in our yard, I placed one pound of ready-to-dye top in a conventional black enameled roasting pan and about 6 ounces of the same top inside a solar cooker. Within one hour, the temperature inside the solar oven reached about 175(f). For the sake heat retention, I didn't open the lid of the roasting pan to check the temperature often, but when I did, it ran about 100-50 (f) lower. It took significantly longer for the larger amount of roving in the roasting pan (with an ill-fitting lid) to heat up to 250 (f) -- about 6-8 hours. In hindsight, perhaps it wasn't the best control subject for this test. With a bit of tweaking, such as utilizing black plastic bags to seal in the heat and aluminum foil reflectors, I suspect the roasting pan method could have its cooking time cut by at least a third. At the end of the day (8 hours, total) I had a over pound of roving dyed, without having to turn on the oven or crock pot. For tightwads like myself, the prospect of free energy is terribly exciting. Being able to reduce my dependency on natural gas and electricity to further my creative endeavors brings my process full circle. It may not be as glorious as the entire solar powered mini mill run by my heroes at Buckwheat Bridge Angoras but it is a start. Special thanks to the Knitting Studio for hosting 'Pippi's traveling roadshow and outdoor dyeing circus. 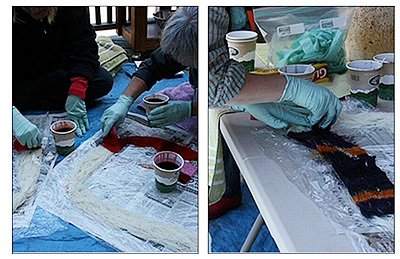 (You can find more pictures of outdoor dyeing on my Flickr.) And to Bridget, Jane, Sandra & Sarah for being such joyful participants. Extra special thanks to the Vermont solar store for providing me a less than perfect solar oven for this project. Building a solar oven is a great summer project, something especially fun to do with the kids. The educational and social lessons to be learned will last a lifetime. Plus, it's wicked cool. DIY solar ovens can be fancy or simple, like my personal favorite made from a pizza box! Have an spinning question you would like to see answered here? Send email to Symeon. PippiKneesocks is Symeon North, or Symeon North is PippiKneesocks, not even years of therapy has begun to sort that one out. Armchair psychoanalysis can be done over on her blog. Just don't expect to get paid.